Ever since the invention of the garage door opener remote, operating these automatic systems has become incredibly convenient. Just imagine having to get out of your car in the pouring rain just to push a wall-mounted button, or worse, manually lift the door open. Unfortunately, remote controls are by no means invincible, If you are looking to get a new unit or are just curious about the different types available today, we've got some helpful information for you. There are three main design options. The standard remote control has a rectangular shape with rounded edges. Some manufacturers have more ergonomic designs for ease of use. The visor remotes have a clip which enables you to attach them to your car’s sun visor for convenient operation. You should be wary about leaving such a remote inside the car when you park it, however, since if the vehicle gets stolen, the thieves would b able to enter your garage, and subsequently your home. The mini remotes have become very trendy too. They are usually around half the size of their standard counterparts and can be easily attached to a keychain. This makes them easy to carry with you at all times. You can select between garage door clickers with one, two and three-buttons, depending on how many motor units you need to control. If you have two overhead doors with two openers, for example, you’d choose a two-button accessory. It is important to note that some manufacturers such as LiftMaster, that produce similar kinds of products like electric gate openers and devices for lighting automation, make multi-purpose remotes that can control with all of these devices simultaneously. For instance, you can open your gate and your garage door and turn on the lights in the garage using the three buttons on the same remote. This allows for more convenience and for a higher level of security since you will be less likely to forget or lose a single clicker, as opposed to three different ones. Now garage door clickers with rolling code technology have become commonplace. This technology makes the remote change to a different access code every time you use it to open the door. This means that it will be impossible for potential intruders to exploit the code, as even if they hijack it using tech-savvy means, it will be useless at that point. 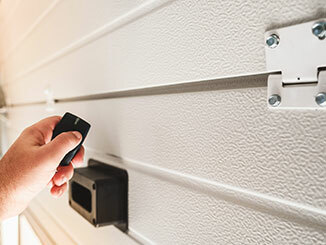 Nowadays, there are also new garage door opener models that offer WiFi connectivity, which makes it possible for you to use your own smartphone as the remote. In conclusion, you should consider your specific needs when selecting a new opener remote. The level of security and the convenience offered by new models are the two main factors you should base your choice on. In general, you can expect the accessories coming from leading manufacturers to be reliable and to withstand daily use and abuse. Get in touch with our team to make sure you get a top quality device made by the industry's leading bands.